Aspiring psychiatrist and high school Valedictorian, Samantha (Sam) Sullivan, never thought she would fall for the one mysterious guy she has been speaking to over the phone for months, the boy the counselors called Daggers. She wasn't supposed to talk to him outside of their sessions. But as she began to peel the layers of Daggers and learn who he is, the one boy she is supposed to be saving, might just be the one who is saving her. A contemporary teen/ya romance with edge. Due to mature social issues presented in the book, this series is suitable for mature teens and young adult, new adults. Includes an excerpt from Loving Summer, a new ya contemporary romance from Kailin Gow. From faeries to vampires, phantoms to angels, Kailin Gow has tackled just about every corner of fantasy and paranormality. Now she’s taking on realistic young adult contemporary with her newest series, the You & Me Trilogy. Her writing’s edgier and appeals to older teens on a much deeper level. There’s much to be said about the emotion poured into Saving You, Saving Me. The main character Samantha Sullivan evokes solid emotions that teens and young adults all over the world experience. She mostly wears her heart on her sleeve so it’s obvious that while she may be perfect at putting others before herself, she also has secrets that she’s afraid to acknowledge. Working as a peer counselor at Sawyer House helps her deal with her own issues. Sam isn’t an avoider, but she finds solace from her less than perfect home and love lives by talking to these anonymous callers. The situations the fictional callers share with Sam are real; they can happen to anyone. There’s a wide range of issues discussed in brief periods throughout the story, such as abuse (self-inflicted and from others), addiction, and lack of self-esteem. Kailin Gow touches hearts by giving these callers, and readers, someone to look to for advice, Sam. She’s young, but definitely wise beyond her years. There’s no denying the impact she’ll have on teens, girls especially, in the future. Over the years, Kailin has introduced readers to seriously devilish and awesome male characters, and the newest drool-inducing guys have raised the bar. Right from the beginning of the story Sam makes a deep impression on not only readers, but the dark and mysterious business mogul, Collins McGregor, and the light-hearted and confident, Derek. Here, it’s not the usual romance story in YA; the relationships are steamier and taken more seriously. Sam is the kind of girl who decides what she wants and sticks to her decisions; she accepts a man with problems and all. 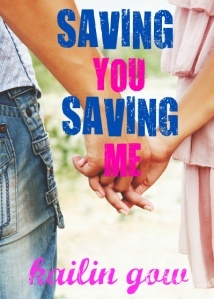 Saving You, Saving Me is only the beginning for these three and the next novel, Finding You, Finding Me, is bound to provide more shocking revelations and unexpected plot twists. Just as Sam works as a peer counselor, devoting her spare time to help teens in need, Kailin Gow has dedicated the Saving You, Saving Me Project to teens in need. This website ties into the You & Me Trilogy and is a place for teens and young adults to anonymously post their troubles. Sounds like a challenging storyline and I look forward to reading this one. Thanks for sharing your review!